Whether you're on a long flight or work in a cubicle, staying still poses multiple health hazards. Fight back with these trainers' tips. For many of us, sitting at a desk for eight hours a day, five days a week is a part of life. 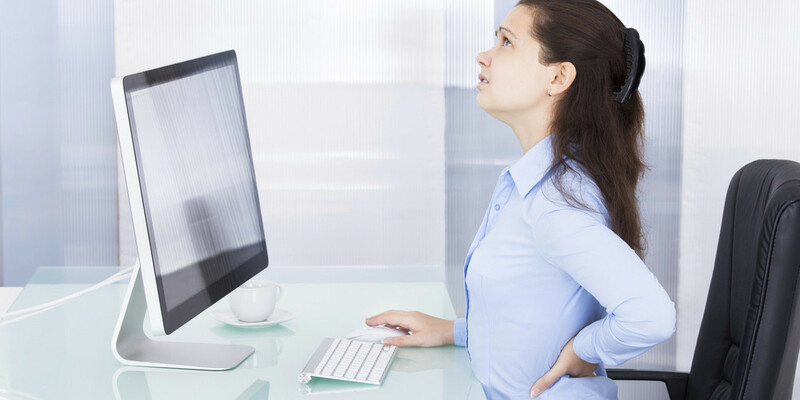 Unfortunately, sitting for long periods of time is one of the worst things you could do to your body. Recent studies revealed that being stagnant in a seated position leads to muscle degeneration, spinal strain, poor circulation, unclear thinking and organ damage. Even if you lead a healthy lifestyle and exercise vigorously, sitting down can negate your hard work. Reports recently discovered that sitting can erase eight to 16 percent of the health benefits you get from exercise. Talk about motivation! Fear not, doomed sitters, you're not alone. We tapped two celebrity trainers—Kit Rich, a Pilates pro who has worked with Kesha, and Harley Pasternak, who has trained Lady Gaga, Rihanna and Halle Berry—for tips on fighting the damage done by sitting. "The only way to counteract the damage done by sitting all day is to not sit whenever you can," says Pasternak. "At work, set a timer on your phone for every 30 minutes as a reminder to get up and just get your blood moving. Do a couple jumping jacks, walk up and down the stairs or do some squats next to your desk." Pasternak suggests never taking calls at your desk. Use headphones and walk around or pace the office as you do business. Rich advises the same, urging the importance of keeping your blood flow going. 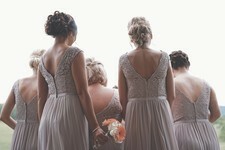 "Try to walk looking straight ahead as opposed to looking down at the floor," she says. "Keep your neck upright with your ears right over your shoulders. This helps improve posture." This might not be an option for some people but if you have the opportunity to opt for a standing desk, do it. "You might feel silly at first, but you'll be surprised how many people in your office might follow suit," says Pasternak. "Better to look silly then shorten your lifespan, right?" This is an especially good idea for those who work from home. Pasternak says he wears his FitBit all day and constantly checks to see his progress. On such devices, you can see what times of day you have no activity and can make adjustments accordingly. Rich suggests trying a pedometer and shooting for 10,000 steps a day. Grab a towel and hold the ends. Imagine as if you are pulling the towel apart. Lift your arms up and over your head and behind you, continuing to pull the towel apart. Bring it back behind your body to where you feel the stretch in your chest and then hold for 15 to 30 seconds. Continue to repeat throughout the day. Come down onto all fours—hands and knees. Place one foot in between your hands and sink your hips towards the floor. It will look like a low lunge with your back knee on the floor. Now bring both hands to the front knee and lift your chest up. The hands can assist by pushing the knee away to get a deeper psoas and hip flexor stretch. Switch legs. Hold each stretch for 30 seconds. Sitting upright against a wall, bring the soles of your feet together and let the knees fall towards the floor. This will help loosen up the inner thighs and hips, which will help keep the back loose as well. Hold for one to two minutes. During cross-country flights or travels abroad you don't have the luxury of space. "No one wants to be the guy doing walking lunges down the aisle," jokes Pasternak. You're quicker to feel restless in the compact cabin and are at risk for side effects such as deep vein thrombosis (when a blood clot forms, usually in the legs). Luckily, our trainers had useful advice to keep in mind for your next getaway. Both Pasternak and Rich suggest getting up every hour and walking toward the back of the plane. "While standing, place your hands behind your head, interlace them and open your elbows, letting your head fall back into your hands. This will help open the chest and counteract what your back was doing while sitting," instructs Rich. "Take deep breaths while leaning the head back." Add on hamstring stretches, like reaching for your toes, and always keep in mind deep breaths. "Try to keep your head back on the headrest—this will help keep your posture upright," says Rich. "If you're reading, just lift the book up to you as opposed to leaning forward towards the book." 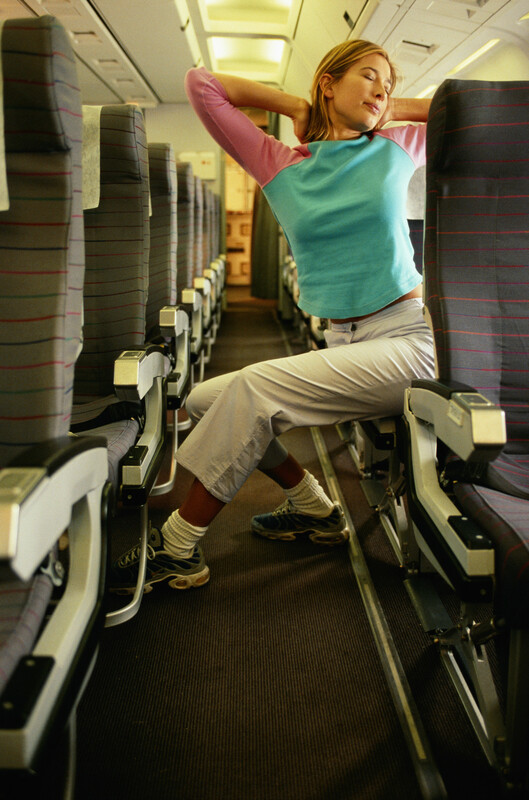 Even at your seat, you can still do a couple of exercises. In between bathroom breaks, you can do leg raises. "Raise one leg a couple inches off the seat and hold it for a few seconds, then repeat with the other leg," instructs Pasternak. "You can also do ankle circles. You're not doing much to tone your muscles, but at least you're moving."